This is a follow up to "Target Long Tail Searches with Keyword Patterns"
The difference in search pattern profiles for these sites is striking. Tripadvisor leads the pack in the long tail, which makes sense given the huge amount of long tail user generated content on the site. TripAdvisor owns most of the pattern categories, but Yahoo Travel and Hotel-Guides take the lead in niche areas like maps and hotels. 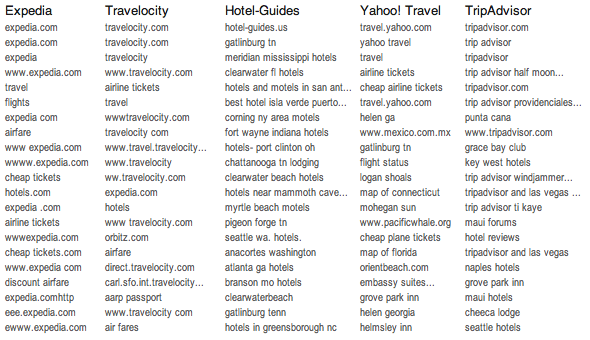 Traffic to Expedia and Travelocity is largely composed of navigational and branded queries (not shown). The only long tail patterns they have significant share for are "[x] ticket", and "cheap [x]". 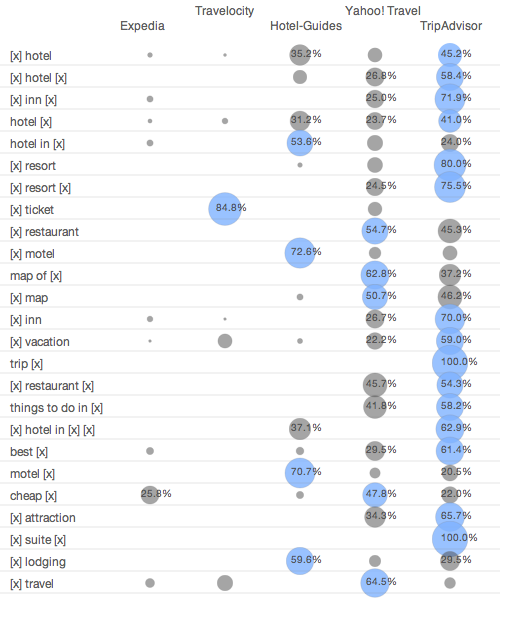 Some queries in TripAdvisor pattern: "things to do in [x]"
Search analytics starts by looking at the most frequent search queries driving traffic to your site or that of your competitors (these are often called the "head queries"). For most sites, these queries are a fraction of your total search traffic and just the tip of the iceberg in terms of insight about your audience. 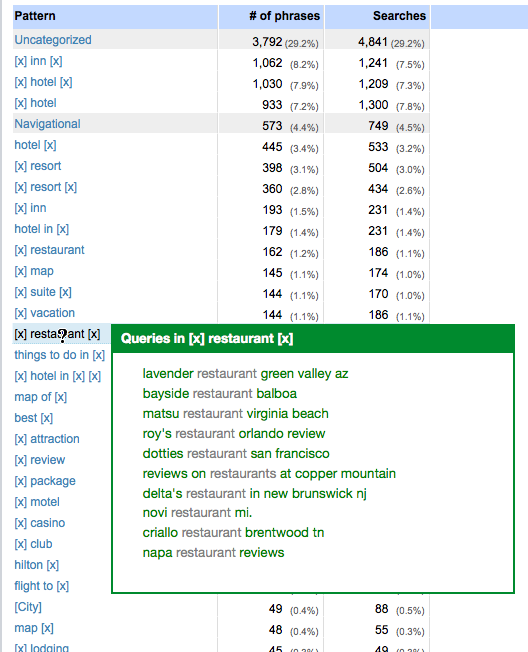 Queries like "cheap hotels in liverpool ny" may only occur once or twice in a given month, but when aggregated with other rare phrases can make up the bulk of your traffic. The concept of the long tail in business intelligence has been a topic of debate over the last few years. One area where the long tail is alive and well is in search. The landscape of user search queries is dominated by the long tail, and most studies indicate that referrals from these long tail phrases are more likely to lead to purchases on your site. Natural search isn’t the only area where the long tail turns out to be critical. Paid search efforts which ignore the long tail are potentially missing out on a large chunk of revenue. The challenge of the long tail is that dealing with massive amounts of query data quickly becomes unmanageable. If you have hundreds of pages of unique queries to sort through manually, forming a actionable view of that data is a painful process. This is why most people only look at the first few pages of queries. Finding frequent search patterns is the key to making search data understandable. Patterns let you to treat groups of long tail searches like popular individual queries. Our concept of patterns is similar to an example described by Brian Brown in a recent SEOMoz post. Patterns are templates for searches that have a similar structure. 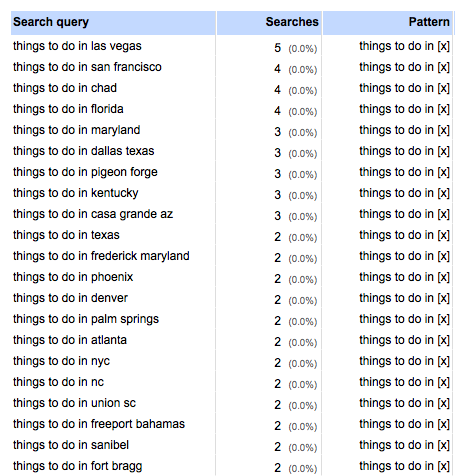 For instance, the pattern “jobs in [x]" represents searches for jobs in some location. The “[x]" is a wildcard that can stand for one or more words. These “masked terms" are often variants of a similar concepts, like locations or celebrity names. Depending on the nature of your site, up to 80% of your long tail search traffic could be summarized using just the top 20 query patterns. The next iteration of Concentrate’s learning algorithms will replace many of these wildcards with named entity labels. For example: “hotels in [x]" will become “hotels in [City]". See our FAQ for more details on special pattern categories like navigational queries. Tomorrow, we’ll cover the travel case study in detail.